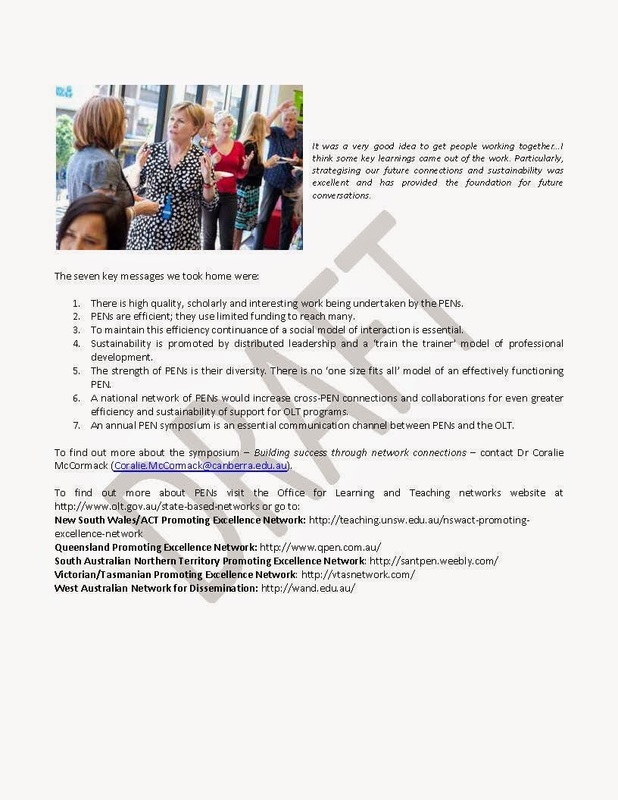 The Network of Australasian Tertiary Associations or NATA was developed from the National Networking Initiative, a 2-year ALTC-funded legacy project. The NATA's mission was to improve engagement and practice through network leadership. The collaborative project included ACODE, ascilite, CADAD, HERDSA,ODLAA, AARNet, Netspot and the Office of Learning and Teaching (OLT). As part of the conclusion to the NATA we have put together a digital brochure to summarise and highlight the outcomes of the project. This document includes links to key reports, resources and groups involved in the network. It provides information on networks in higher education, OLT Good Practice Reports and network leadership. Please feel free to download and share this document. November 2014 saw forty members of Office for Learning and Teaching (OLT) state-based promoting excellence networks (PENs), representing all PENs across Australia, gather at the University of New England Parramatta Future Campus to celebrate the success of the OLT’s networks initiative. PENs are charged with consolidating existing connections in the higher education sector and helping to foster new collegial and cross-institutional links to generate high-level collaborative approaches to teaching and learning issues. We would just like to remind everyone that ascilite now has a new url (www.ascilite.org). We have updated the links on the static pages of the NATA website to reflect this change, however, other materials or blog posts already published or finalised are unable to be updated and we forgive any inconvenience this may pose. NATA eResources are now available on YouTube. Be sure to check them out to learn more about the OLT/ALTC Good Practice Reports and how they may be of value to you. With the successful completion of the NATA Seminar last week, the NATA comes to a conclusion. The project has been a long and interesting process which has involved a range of organisations and a large number of individuals. On behalf of the project team I would like to thank everyone who has contributed and make special mention to the partner associations of ACODE, ascilite, CADAD, HERDSA, ODLAA, AARNet and NetSpot for their ongoing support. Funding from the ALTC/OLT made this project possible and we hope that the many resources developed, specifically those with a focus on educational networks and network leadership provide a solid foundation for further work in this area and improved networking practices. With the conclusion of the project we will remove the @NATAonthenet Twitter account, however, this website will remain active. Please direct any future questions or queries regarding the NATA project and its outcomes to project co-leader, Professor Mike Keppell at the University of Southern Queensland. Where in the World is Alor Setar?